I can't resist observing that of the recordings of Schubert's famously 'Unfinished' Symphony, some appear rather less finished than others. I had thought that this acoustic recording from 1923, which squeezes each of the two movements onto just two short sides of 78s probably held the record at less than half the usual duration. I am reliably informed, however, that a recording by Albert Ketelby fits the entire symphony(!) onto a single 78, with a movement per side! Clearly there have been significant cuts to make this recording - perhaps few record companies at the time felt that few of their customers would have the patience to handle a longer recording, especially given the limitations of the pre-microphone era from which it dates. And yet the music comes across remarkably well here, and I would have been happy to hear a good deal more of it. A word to collectors, too, about those record catalogue and matrix numbers listed above. Wood recorded this work twice. The present recording quietly replaced one made on or around 3rd July 1919 in the Columbia catalogue, with the same matrix and catalogue numbers attached to both. The 'take' numbers given here are by convention, and are not shown on the discs themselves (how you can have a third or fourth take some four years after the first and second takes is beyond me!). 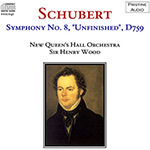 The key to differentiating between the two recordings is in the credit give to the orchestra, with the earlier labels stating "Sir Henry Wood and his Orchestra". I have yet to determine the reasons for the remake, which remained in the Columbia catalogue until 1927.